MONTICELLO, Fl. (WTXL) - Aucilla Christian Academy in Monticello may be small, there's just over 300 kids in kindergarten through 12th grade, but they have athletes aplenty. On Monday, three Warrior athletes signed Letters on Intent to continue their careers at the next level. 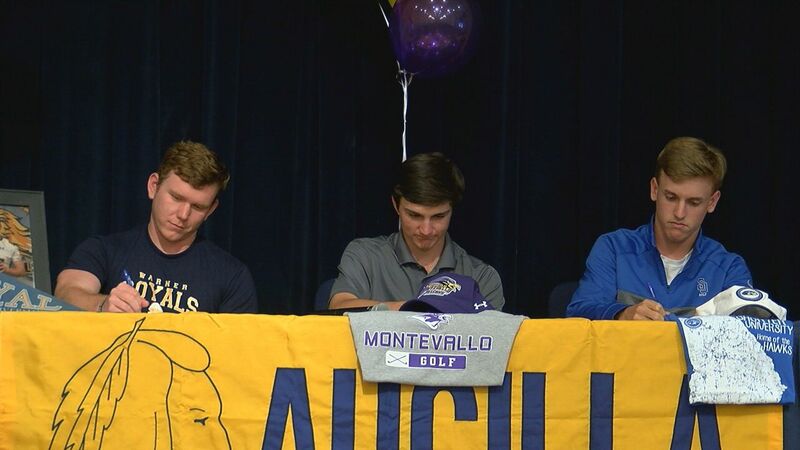 Evan Courtney will play football at Warner University in the fall, while golf standouts Ryan Jackson and Cody Smith will suit up for Shorter and Montevallo respectively. "All the hard work paid off," smiled Smith. "All the talent God blessed me with, I'm finally living out my dream. Ever since I picked up a golf club back in middle school, so it feels great." "It's very exciting. Very honoring, very humbling at the same time," said Courtney. "I can't wait to go to college and play again." "All the balls hit and all the time spent out on the range, it just feels so good for it to pay off finally," added Jackson.